Sony PlayStation’s new chapter in the God of War franchise finally released on April 19th, and we’ve been giving it most of our attention. The title was created by Santa Monica Studio this time around, and God of War director Cory Barlog really delivered. Anyhow, on to our first day play impressions. I started playing at the lowest difficulty setting “Give Me A Story”, to get my bearings and see what the new game mechanics are. Instead of this being called “easy”, it’s listed in the settings as “more story, less fighting”, which is kind of cool. It’s obvious the designers wanted this title to appeal to more than one type of gamer. 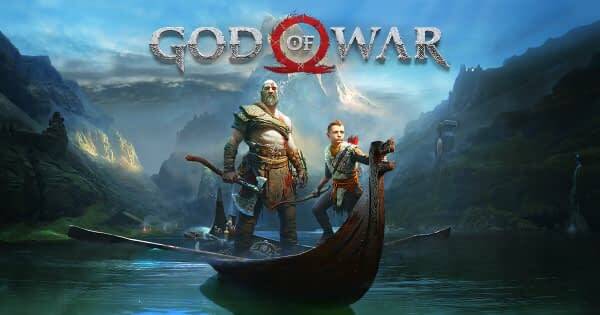 We’ve known the basic premise of Kratos (voiced by Chris Judge) and his youngest son Atreus (Sunny Suljic) going on a journey of both magic and familial discovery. As the game begins, you learn that Kratos’s wife has passed away, and she wanted her ashes to be scattered at the top of the nearby sacred mountain. Your mission is to do this for her, while at the same time teaching and protecting your demigod son who has no idea what your real nature is. You’ve heard us say it before, but the world vendoring and cinematography are just incredible. Rich colors and textures abound; from the fur of your shoulder armor to the wooden crates and vases you smash in order to collect hacksilver throughout the maps. The. MUSIC. We’ve talked a lot about this too, and it’s not JUST because we’re fans of Emmy-winning composer Bear McCreary‘s sizable catalog of work. He really managed to capture something both folky and super frakking metal about the Viking world, the use of full chorus unique enough to not immediately evoke memories of Skyrim. The heart pounding cues during fights are perfect, and yes, you can pre order the deluxe vinyl God of War soundtrack now from MondoTees, and from Amazon and iTunes. Fighting the Stranger (who, if you know your Lore, is either Floki or young Odin, depending on what part of Viking Country you’re in) is an incredible visual feat. You almost don’t want to win, because as it continues, he gets stronger and so do you. The World Snake appearing in the Lake of Nine is also a holy-crap-this-is-awesome moment for me personally, loving Viking mythos as I do. He’s absolutely gorgeous, his size immense, and his presence both comforting and disturbing at the same time. Thus far I only have one big complaint, and it’s a silly one. I have a large-ish TV, and when I am trying to upgrade my gear or read the prompts for which buttons to press, I can’t see the text because it’s so small. Maybe on a smaller screen it’s not so noticeable? There also isn’t a way to set text size, so this is not really a gameplay issue and more of a “man I wish I could read what that says” issue. Needless to say, we’ll write more as we progress further in the game.